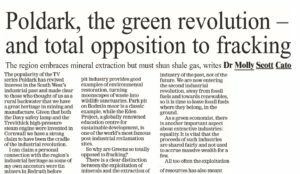 “There is a clear distinction between the exploitation of minerals and the extraction of shale gas. The distinction is really about whether an industry has a future or not. If we are to continue to have mobile phones we will need tin and tungsten. But the Paris Agreement on tackling climate change means fracking and a dash for gas are incompatible with the commitment to holding global temperature rise to under 2˚C.